You’ve got to know your weight. To stay fit and healthy we should pay attention to that all important bathroom scale. Bathroom scales seem like a mundane thing, but they really are a very useful tool. When placed properly on a firm, level surface, they can provide you with a surprising amount of information! It isn’t just an accurate weight that the modern scale can provide. Body fat percentages, water weight, and even bone density are all options! That means you’ve got to know what your needs are when you start shopping for the best bathroom scale. In order to find the best bathroom scale, you’ll need quality information fast! That’s what you’ll find in the chart below to make your shopping experience easier. 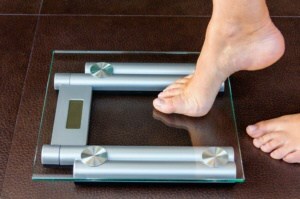 Bathroom scales have been around for generations and provide people with information about their weight. The modern innovations of the bathroom scale, however, take that data to new levels. By incorporating a small, safe electrical charge through conductive pads, scales today can let you know how much body fat you have. They can help you calculate your BMI, tell you your muscle density, and even determine your bone density! Why is all of this data needed? Because it is essential to the weight loss or muscle building process. 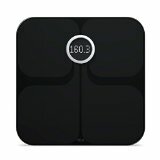 Some of today’s best bathroom scales even coordinate with fitness bands and other technology. This helps you graphically track your progress toward weight loss or that marathon you’re training to run in a few months from now. If you just need a weight measurement, most scales will provide you with pounds or kilograms, based on your preference. Some will show you your weight in stones too! With so many different scales providing a wide variety of unique features that go beyond a basic weight, it is important to have information about your own needs first. Then, bathroom scale reviews are the best way to choose the scale that has the features that will best meet your needs. You can quickly find scales that can meet your needs and then make a decision on the best scale for you. After going through a bathroom scale review, it is important to consider how that scale will sit on your floor. Many bathrooms today have been upgraded to a tile floor and that’s actually a bad thing when it comes to the modern digital scale. Tile floors are designed to slope towards a drain. Because the weight sensors are on the feet of the scale, any variation in floor height will create variations in weight that is measured. Find a level place in your bathroom or home for the best results. You’ll also want to look at the platform height of the scale, especially if you have some special needs that must be met. Standard scales today have a step-up of at least 6 inches. Some are even higher than this! If you have knee issues or other joint or movement problems, that can be too difficult to achieve. With ultra slim options that have very low profiles, sometimes as little as 2 inches, you can easily step onto the scale and get the results that you need. Many scale manufacturers have worked hard to eliminate the common problems that have existed in previous models, but there are still some scales with issues floating out on the market today. What should you try to avoid to ensure you are purchasing the best bathroom scale? Tap-on scales if possible because they can error out easily and require a full reset if you don’t tap them just right. Tempered glass is impact resistant, but not necessarily scratch resistant. Some scales use glue to affix their weight sensors to the platform and this can degrade when exposed to a high moisture environment. Calibration is also a major issue with digital scales and inaccurate readings are by far the most common complaint with the modern scale. Look for a scale that will give you a manual calibration option to offset this problem. If you need automatic calibration, then try to find a scale that has a solid reputation for good results. When you do own the best bathroom scale to meet your needs, then you’ll have a useful tool that will help you meet your fitness goals. Whether you’re trying to lose weight or you’re working on building up your muscle mass, you’ll be able to get an accurate reading that gives you the information you need to track results. 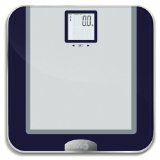 The best bathroom scales today also give you a fast measurement of other body data that you can use to track results. Some scales even have pulse sensors incorporated into the platform so that you can make sure you’re staying within your target zones. 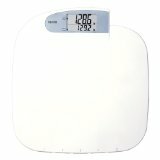 To find the most success, look for the best rated bathroom scales on websites like Amazon, use the comprehensive reviews on websites like ours, and when combined, you’ll find the best bathroom scale for your home. 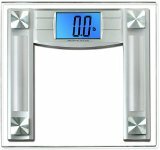 What Are the Prices of Today’s Best Bathroom Scales? What’s the price tag on the best bathroom scales? Much of that depends on the type of scale you want, the features of that scale, and the mechanisms that are used to get an accurate weight measurement. Entry-level scales on Amazon today are priced right around the $20 range. On the other end of the pricing scale, there are options that are priced around $250 that provide a massive amount of features and long-term accuracy. 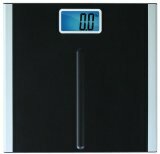 The key feature that stands out on this digital scale is its 4 high precision sensors that are included within the design of the scale. It provides measurements at 0.2 of a pound for greater weight accuracy so that there is a consistent and accurate result every time you step onto the scale. Powered with 4 AA batteries and weighing less than 5 pounds, this scale is designed to be a tool to help you keep track of your weight on a daily basis so you can develop healthier eating habits. For further encouragement, a weight loss tape is included with your purchase of this scale to help track inches that are lost over time. Modern and stylish, the EatSmart Precision isn’t going to stand out like a sore thumb in your bathroom! One of the best features of the Withings scale is the fact that you can monitor your weight and body mass index online instead of through the memory on the scale. You’ll get access to a private website that is password protected so that you can always stay on top of where you are from a fitness perspective. It works with MyFitnessPal, Runkeeper, and LoseIt as well so that you will be able to achieve and maintain the body shape you want. If you’ve got a large family, then the Fitbit Aria is the perfect digital scale for you! It will automatically recognize up to 8 unique users and track all of their eating and exercise habits when combined with other Fitbit technology. 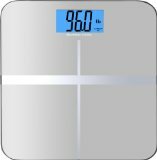 This scale will specifically track BMI, body fat, and weight so that the stats from every workout can be fully complimented. It’s easy to setup and use as well – just open it up, make sure the batteries are in, and step on the scale! It’s the extra large LCD display that really stands out in the design of this BalanceFrom scale. Featuring a cool blue backlighting and extra large fonts, you’ll be receiving a 4.3-inch display that can be read quickly and easily in almost any conditions, including a foggy bathroom! It might be an entry-level price, but the features of this scale are far from basic. You won’t be able to measure your BMI or know what your lean mass index happens to be, but you will know how much you weigh every day in an accurate way and that’s why most people own a scale in the first place. Order it in silver or black today and you’ll be able to accurately measure up to 400 pounds with a simplicity that is difficult to match at this price point. It’s the new step-on technology that EatSmart has included in the 2014 models of their scales that we really like. The old EatSmart scales needed to be tapped with a foot in order to get them to work. That was bothersome at times because you either needed to use a lot of force to get the scale to activate or the results would error out and make you take 10 minutes to get your weight! Now you just step onto the scale and get an accurate reading and that’s pretty awesome. Going beyond the synchronized dial and LCD display that illuminates in pounds and kilograms, we love the fact that the entire dial is 5.5 inches in size. You won’t have to worry about trying to read your results because you’ll be able to quickly see what your weight happens to be. It goes up to 400-pound measurements as well, so it is going to work for a majority of people. You could pay twice as much for a digital scale that will give you half the results that the Ozeri Rev is able to provide. It looks great, operates well, and will give you the information you need to achieve your next fitness goal. This tracking scale offers you the easy-use options that you’ve come to expect from the modern scale. You just step onto the scale to get the reading that you need and the scale will automatically identify who you are and what your weight goals happen to be! There’s no tapping or switches to turn on or any other nonsense. When you need your weight, you just step on and get it. If you’re looking for a highly effective way of managing your weight that doesn’t involve modern fitness trackers, apps, and expensive technology, then this scale by EatSmart is the way to go. You’ll be able to track daily weights and always know where you stand on whatever fitness goal you have. This is the bathroom scale for you if you just want to be able to track weight on a daily basis. It comes in four different colors so you can coordinate the scale with your bathroom. There’s no tapping involved or a need to flip on a switch with this scale either – you just step onto it and it will read your weight for you. It provides an instant reading and with the non-slip feet, you won’t have to worry about scratching your floor. Running on 4 AAA batteries and with weight measurement graduation at 0.2 pounds or 0.1 kilograms, stones are also an available weight on this scale. When all of the features are combined, it is easy to see how the accurate results will keep coming consistently on a scale that can measure up to 400 pounds. When looking at this scale, the immediate feature that stands out is the removal of the need to tap it in order for it to work. You can just step right onto the EatSmart Precision Plus and be confident in the results that you’re going to get! With 4 sensors placed at the corners of the unit to measure even weight distribution, this automatically calibrated platform won’t take up a lot of space, but it will give you the results you want. If you’re looking for the best bathroom scale, this could be it! What is really nice about this scale is that it has a very low profile. It’s super slim, but provides and extra large platform upon which to stand. The 2-inch, 2 line LCD display is easy to read and it will show the current weight and previous weight for up to 5 different users. There isn’t automatic recognition with this scale, however, but you can press a button with your foot before getting on to get your specific results. That’s why it is one of the best bathroom scales on the market today! 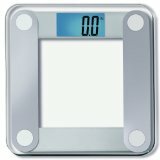 How could you use one of the best bathroom scales on the market today? Whether you need something for the home, a gym you own, or a weight loss-tracking tool, there is a scale for you to use today. Be sure to read our comprehensive reviews, use the charts that give you a fast look at the facts you need to know, and you’ll be able to make a wise investment into a solid product that will last for years to come.